"Using very little liquid, your electric pressure cooker can whip up creamy mashed cauliflower in next to no time. Feel free to add additional Parmesan or any other shredded cheese you like. For a vegan version, use oil in place of butter, skip the cheese entirely, and stir in some nutritional yeast or ground chipotle at the end for additional flavor." Turn on a multi-functional pressure cooker (such as Instant Pot(R)) and select Saute function. Melt butter in the pot and add garlic. Stir until fragrant, about 30 seconds. Add cauliflower; stir until cauliflower is coated in butter and starting to become tender, about 5 minutes. Add broth. Close and lock the lid. Choose high pressure and set timer for 5 minutes. Allow time for pressure to build. Release pressure using the natural-release method according to manufacturer's instructions for about 3 minutes. Release remaining pressure carefully using the quick-release method according to manufacturer's instructions, about 5 minutes. Unlock and remove the lid. Mash cauliflower using a potato masher or stick blender. Stir in Parmesan cheese. Season with salt and pepper. 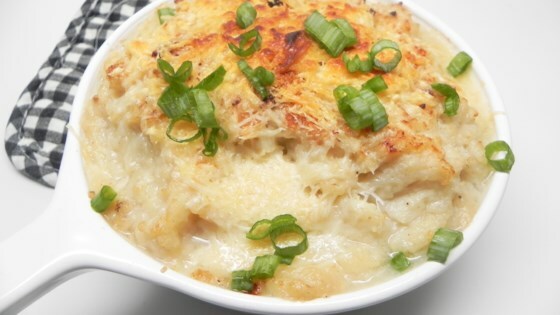 Smooth, creamy, low-carb mashed cauliflower is a tasty alternative to potatoes.